For shoppers on the west coast, Save-On-Foods only lets you buy in-store deals if you have a More Rewards card. The company had an older app in the App Store, but that version is no longer supported, now directing customers to download the latest one. 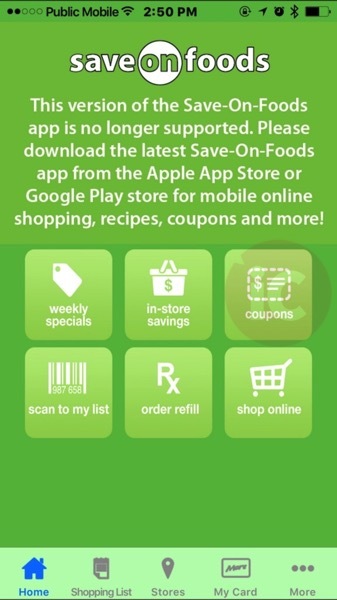 Customers using this older version will require to download the latest version of the Save-On-Foods app, available in the App Store. Lacking is Wallet support, which would allow customers to easily add their More Rewards card and access it from the iPhone Home screen. If you thought you’d lose access to your More Rewards card on iPhone in iOS 11, this app will bring your card back to life. Click here to download Save-On-Foods for iOS in the App Store.